If the election was a referendum on the Government then the Coalition has lost, writes David Donovan. OPPOSITION LEADER Tony Abbott may have fond referendum memories from 1999, but his statement at 1.56 am on election night that the 2010 Federal "...election has been a referendum on the political execution of a Prime Minister" could come back to bite him. If the Independents take his advice here on how to choose the Government he'll probably remain in Opposition for the foreseeable future. "Considerations that I’d take into account was who won the most seats? Who got the greatest vote? What would people in this electorate want? What are some of the significant issues in terms of regional Australia? 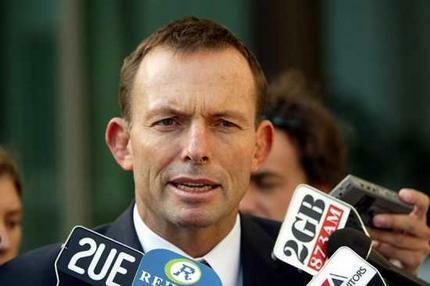 And, most importantly, [who would provide] stability of governance for the rest of Australia." So, if this election was a referendum on whether the current Government should continue, then what was the result? The template for referenda is set out in the Australian Constitution. There, the basic formula is that a 'yes' or 'no' proposition would require the assent of a majority of voters in total and in a majority of the states (not territories). Since our system enforces compulsory preferential voting, so that the final count in each electorate is usually between the two major parties, it is quite simple to use the two-party preferred (2PP) vote nationally, and in each state, to apply this to Abbott's idea. Using Abbott’s words, the proposal might be "Do you want to oust the current Government because of the way it treated ex-PM Kevin Rudd”. A vote for the Coalition would be a 'Yes', a vote for the Government a 'No'. As you can see, a Coalition referendum to throw out the Government would fail on both counts. Firstly, it didn't win the national vote, gaining only just over 49% of the total. Despite curious media reporting, even on the ABC, that the Coalition had won the popular vote, reference to the AEC website even on election night showed the Labor Party ahead on this measure. The Coalition also would not achieve a majority of the voters in a majority of states. It would end up with 3 for Labor, 3 for the Coalition. If the territories were included, which is strictly unconstitutional, although indicative, then the result favours Labor by a resounding 5-3. Only in Queensland and WA is Labor relatively unpopular. In NSW, it is just below parity and in NT slightly better than par. Labor is strongly popular in Victoria, South Australia, Tasmania and the ACT. Frankly, it is hard to see the argument for the Coalition to take Government based on these figures. If the Independents decide to use this methodology, Abbott may rue an indiscriminate comment after about three days without sleep.